Several factors, including environment, genetics, nutrition and infection contribute to incidence of lame cows . This article explores the causes of lameness and what farmers can do to reduce the occurrence in their herds. A number of factors may be involved in predisposing dairy cattle to lameness. Dairy cattle have to walk into the milking shed to be milked twice a day for around 300 days per year. This involves walking on tracks and then spending at least 2hours standing on concrete. If the environment is moist, the hooves tend to soften and they become more susceptible to abrasions of the concrete or penetration by sharp objects. If the environment is very dry, the hooves can become brittle and fissured. In this situation hoof cracks are common. A proportion of cows show a genetic predisposition to certain problems eg cork screw claws. In other cases things like poor leg and foot conformation seem to predispose to lameness but evidence of the extent to which they are inherited is conflicting. 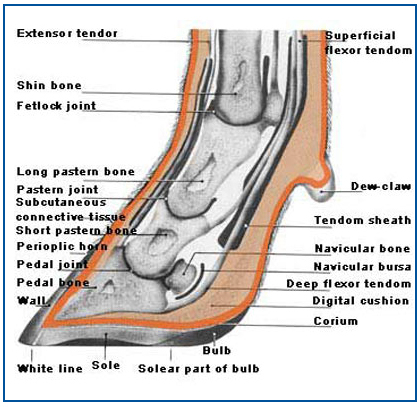 Footrot is one of the most common causes of foot problems in dairy cattle. It is caused by a bacteria which can survive and accumulate in wet tracks, muddy gateways and other commonly used moist areas of the farm. Simple hygiene measures and drainage can do a great deal to control footrot. High grain inputs and lush grass in combination with low fibre intake may predispose cows to laminitis and a greater susceptibility to foot problems. Track condition and design (especially around the dairy). The patience of the farmer when moving cattle. When cows walk under no pressure, they are very good at avoiding foot damage. They walk with their heads down checking the surface, placing their hind feet in the same spot as where their front feet were placed. They tend to walk in rows, with little contact between cows and in a pecking order, with the dominant cows at the front. This behaviour is however disrupted when cows are forced to slow due to poor tracks or narrowing in the track. If cows are pushed too hard from behind, by the farmer or dog, the cows at the back (generally the younger stock and less dominant cows) are unable to push the more dominant cows in front. These less dominant cows push each other, skid and lift their heads. The result being they no longer avoid the rough areas of the track, they increase the chances of getting feet injuries and they increase the wear on their hooves. If this is occurring then slow down when bringing the cows in to milk. Track design and composition is also very important. 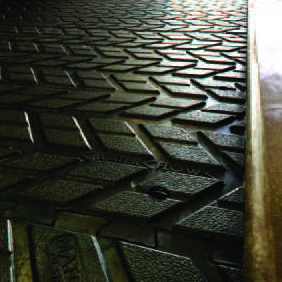 The track surface should be made of a non-abrasive, impervious material, with a well compacted base. The track should be 4 to 6 meters wide, 600mm above the water table and with a crown for drainage. Concentrate on the 300m closest to the dairy. Other problem areas to pay attention to are in gateways, around troughs and the junction between concrete and tracks. 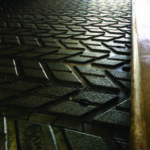 You should try to eliminate sharp bends, narrow points or rough, wet and slippery areas of track. The yard should be built to minimise cows having to twist and turn and the concrete should not be too rough or too smooth. Try to eliminate factors that make cows reluctant to go into the dairy. Footbaths will help in the control of footrot and may help harden hooves. 5% copper sulphate solution can be used and is effective but must be changed every milking. 10% Zinc Sulphate can be used two to three times weekly. It is important that the treatment is changed every 500-800 cows. 5% Formalin can be used but the fumes are dangerous to humans when mixing and if the foot bath is under the dairy roof or too near the pit. Formalin doesn’t need to be changed as regularly but hot weather evaporation can cause it to concentrate quite significantly. Care should also be taken to ensure that the footbath does not get contaminated with faeces and become a source of infection. The bath should be long enough so cows cannot jump over it and deep enough to cover the coronet. 2.2m long and 20-30cm deep should be adequate, ideally there should be a water wash area before the bath and concrete after it. Early Detection and Treatment of Lame Cows is Essential. The longer lame cows are left the more dramatic the damage. So either have a look yourself, our call us to arrange for a veterinary visit and to get advice. WestVic Dairy has produced a series of factsheets on lameness and lameness prevention click on each title to access the resources. Read previous articles on lameness treatment and prevention. The dedicated web page contains similar information to this post. Practical common-sense information in DVD format and available now from Warrnambool Veterinary. 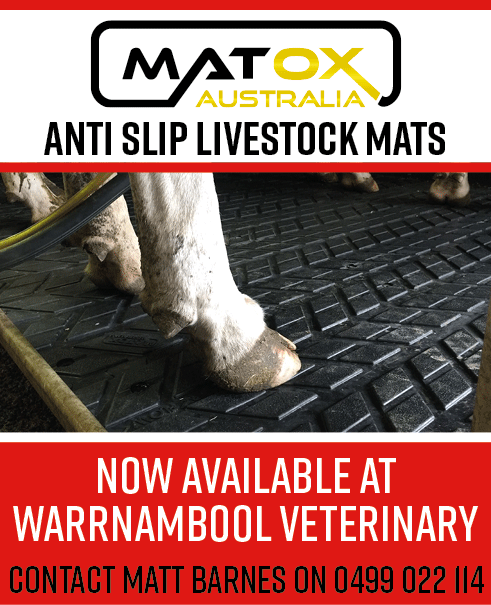 Engineered for Australian livestock and production systems the mats are a weapon against lameness in dairy herds and are available now at Warrnambool Veterinary. Give Matt Barnes a call on 0499 022 114 to discuss how Matox Mats can reduce the incidence of lamensss in your herd. The Mobile Tipper Crush works in a similar way to a traditional crush set up. The cow walks into the crush, it’s head is secured and the gate closed behind it. Straps are fitted beneath the animal, before it is raised with hydraulic winches and gently tipped onto its side. The feet can then be secured, allowing the operator to treat all four hooves at a convenient height without the threat of being kicked. The crush is highly portable, allowing it to be used in outpaddocks or away from the dairy, as long as there is some sort of yarding facility where a race can be created.